Located 25 kilometers [15.5 miles] from Torres del Paine National Park and some 125 kilometers [77.7 miles] northeast of Puerto Natales, on the basin that feeds the glacier Amalia, in the region of Magallanes, stands a mythical volcano. The first record of the volcano, dates to 1879, when the crew of the schooner Alert witnessed its eruption and named it Reclus in honor of the anarchist and celebrated founder of social geography, Élisée Reclus. Afterward, in the early years of the 20th century, the Swedish geologist P. Quense tried to locate the exact location of the eruption. However, they confused it with the hill “Mano de Diablo”. In 1987 and thanks to helicopter overflights, the exact location of the volcano was pinpointed, 10 kilometers [6.2 miles] from the hill of Mano de Diablo. Due to climate change accelerated by the development of a devastating capitalism, it’s becoming easier for those that come from Amalia glacier to see the volcano. Still reaching the peak of the volcano requires specialized hiking equipment and it’s important to have other assistance and supports. The few who have visited the summit mention that the place is surrounded by a lush nature with huemules [southern Andean deer] walking the paths that were formed by volcanic rocks expelled from the volcano hundreds of years ago. Reclus was known as an indefatigable traveler, lover of the Earth and meticulous observer of all the elements of the landscape, characterizations that are reflected in his fruitful geographical work. He had the opportunity to travel through Chile and dedicated a book to the geography of the region, a work titled “La Jeografía de Chile” [The Geography of Chile]. As an anarchist theorist he developed distinct analytical perspectives in which he defended a society without hierarchies, a social order that for Reclus would come about through the evolution of humanity, with more anarchism everywhere, - and support – an anarchist society could evolve. The real school, Reclus thought, should be the freedom of nature with its beautiful landscapes to contemplate, with its laws to study, but as well as with its obstacles to overcome. Do not educate the spirit of humans in narrow rooms with barred windows. It is in the joy of bathing in the lakes and the streams of mountains, the walks though glaciers and fields of snow, it’s climbing the high peaks where one can find the genuine motivation and reflection in accordance with a life of freedom. In nature we don’t only learn with an ease what some book could say, but we also have encountered the danger and faced it head on. “For Reclus, evolution and revolution are two closely related concepts, that are not contradictory to each other. And to such a point this relationship generates very few times where one can define the limits of one or the other. In his opinion, the simple addition of violence doesn’t mark a difference between the two terms, since he argues that there are both violent evolutions and quiet revolutions. And what establishes the difference between the two is the step, the action, and the development beyond the establishment. According to this view, evolution turns into revolution at the precise moment when it gives rise to that jump, that leap before a new vision, a new situation. And once the process has exhausted itself, normalized, the revolution transforms into evolution. And so it goes, this continuous and eternal movement makes up life itself. For Élisée Reclus libertarian socialism is made up of a movement for the accession of a society in which there will be no masters nor jailers, neither rich or poor, rather brothers that will have their daily bread, equal rights, a peace and cordial union, not because of obedience to the laws, that are always accompanied by terrible threats, but by a mutual respect of interests for the scientific observation of the natural laws. In remembrance of such libertarian perspectives, did the crew of the schooner Alert bestow the name Reclus when they saw fire in what appeared like a volcano as they sailed by in 1879? We don’t know. The documents to which we’ve had access highlight the importance of Reclus as a geographer, however it could also be because of him being known as a diffuser and defender of anarchist ideals. This second option would not be surprising, if we consider that within the shipping industry anarcho-syndicalism has had a great influence since the late 19th century. Interesting similarities exist between the activity of the volcano and the thought of Reclus. Volcanoes erupt after long periods of inactivity, which can be compared to building-up an anarchist movement. Throughout many centuries and infinite actions and lessons, men and women have been motivated by the beautiful ideals of love, mutual aid, direct action and horizontality, have consolidated anarchism as one of the most important expressions of societies search for freedom. After centuries of slow evolution, the anarchist movement defined itself by concrete revolutions that marked periods of great social change in modernity, eruptions that have resisted the development of capitalism, movements that perhaps some have incorrectly labeled as spontaneous. Be that as it may, spontaneous doesn’t mean with causality. Nor does it mean to say from one day to the next. Thus, anarchism like volcanoes and their black and red eruptions, hatch the social landscape, forming new ways and moral paths, evolutionary preconfigurations towards total liberation. Like volcanoes, anarchism is organized from below and in union with many distinct forces generate social eruptions that often surprise. However, anarchism, unlike volcanoes doesn’t violently attack the towns with its lava, instead it frightens those who work alongside the misery of oppression and injustice. In 2012 the communities near Puerto Natales, the seismic authorities and ONEMI, were alerted due to the seismic activity recorded. It was thought that the volcano Reclus was the origin of these movements. Expeditions and studies were done, which helped learn more about the volcano and surrounding environment. Despite the alarms no apparent lava flows around the volcano have been found and seismic monitoring in the region can’t be directly linked to the volcano. 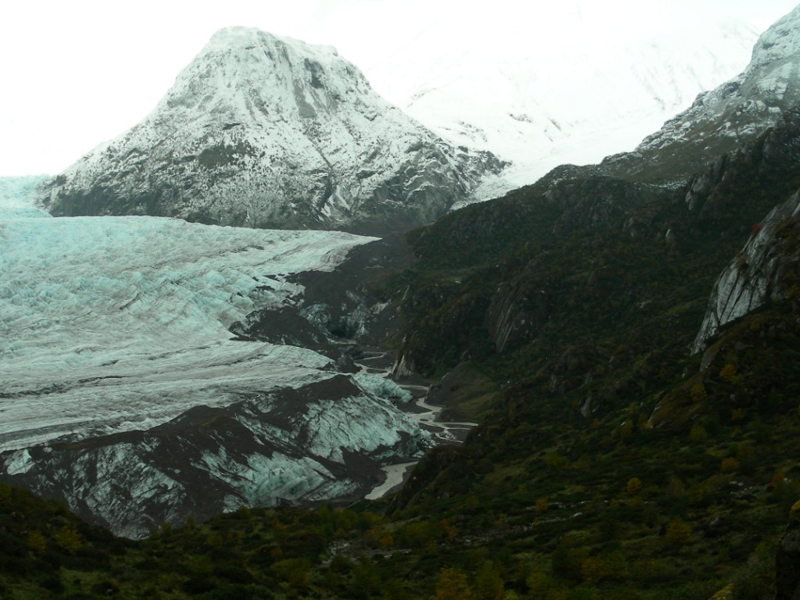 However, nature has warned us of climate change, as the glacier that surrounds volcano Reclus has thawed at a steady rate. Volcano Reclus, like the French anarchist geographer, reminds us of the importance of fighting for a life of freedom, where natural environments, territory, water and people resisting capitalism are respected. Just as the workers of the Patagonia Rebelde fought in 1921, just as Matías Catrileo, Luis Marileo and Patricio González fought and gave their lives, among many others. Without a doubt, volcano Reclus will be more visible due to the melting of the glacier Amalia, likewise we hope that the formidable work of the French geographer becomes more visible and studied in accordance with his desired maximum expression of order: anarchy, association without authority.